the little man has been sick for the last couple of days, unfortunately this didn't mean any extra knitting time for me :( but a few hours spent at the grandparents' on monday plus a quiet evening and i finally made some progress with his Milo vest. so much that only the body remains and as i'm skipping the cable pattern (it's my first Milo, but i'm sure there're more to come, with a cable!) i think i might finish it within this week. i have some very lovely Malabrigo Rios yarn waiting to be cast on as well, an upsized Puerperium for the junebug, as she has almost outgrown her first. reading has been fun, my mum got some pocket-sized Disney classics from the attic that simona and i had read when we were small... so many memories returning! the brown scarf i started last week is finished, the only thing i want to add is a crochet flower as embellishment. there is a youtube video i found on how to make one that seems easy to follow, i'll try it out and then let you know by next week if it worked. in the meanwhile i started a new scarf, one for hubby. he came to the craft store with me to pick out yarn, that was fun! since i got tired of using one color only i'm trying out how to alternate colors and make somewhat of a pattern. while using more than one color makes it more interesting, it definitely slows down the progress. still, i am hopeful to get it done by next week. we're joining ginny's yarn along. what are you knitting and reading? also joining frontier dreams keep calm craft on. I hope your little man is feeling better Sylvia. I too have been skipping the cable on my milos, but I do think it is time I give them a go on the next one. So much fun returning to childhood favourites with our little ones. Lovely colours you are working with Simona, love the scarf. I hope your little man is feeling better Sylvia and you find a little more time to knit. I love the Milo pattern, especially how it can grow along with the little one. Simona, you really caught on quick with your knitting! My husband comes to the yarn store with me too, it makes for a great date. Is this the first sister post.?? It is for me, both you girls have lovely projects on the needles. I think I miss my sister!! 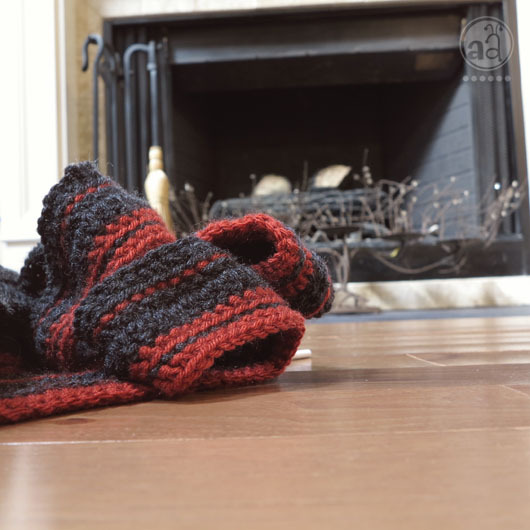 Look at your projects and fireplaces! Oh, how clever! I love this. 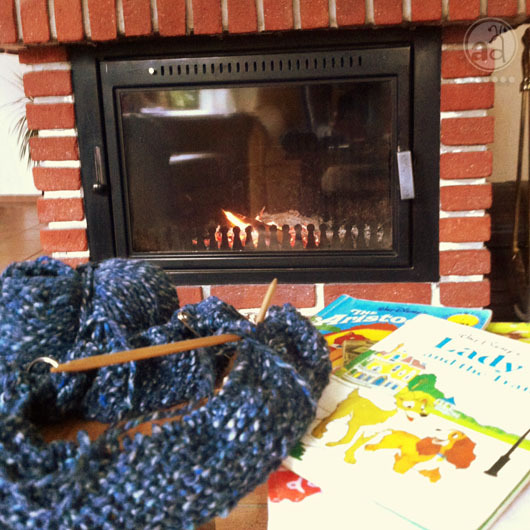 Cuddle in front of your fireplace with a cup of hot chocolate (or possobly black tea/cappuccino), holding a book or knitting needles/crochet-hook in your hand/s and be happy.